Probably originally released in Germany in 1969, though uncertain about possibility of an early Polydor release. First released in the US in 1975 on Arista Freedom with the title Paper Man. Live recordings from 1970 and 1973. Two of the CDs comprise material previously released on the Strata East albums Music Inc. Live at Slugs, Vols. 1 and 2 and Music Inc Live In Tokyo. The third CD comprises six previously unreleased tracks. Brings together the two albums released on Strata East; Music Inc (1971) and Impact (1975), together with previously unreleased tracks recorded in Germany in 1979 by Charles Tolliver's group with the NDR Big Band. Music from a previously unreleased 1968 session. Notes : A 4 CD/6 LP box set that includes the albums It's Time!, Action, Right Now!, Jacknife, and Consequence. Charles Tolliver plays on the tracks from It's Time!, Action and Jacknife. Collects together the 1967 and 1968 albums Libra and Another Earth. Charles Tolliver plays on Another Earth. 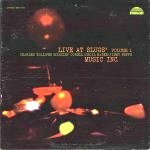 Music recorded for Blue Note between 1967 and 1970. Six of the tracks have been released before on the One For One collection. The remaining 25 tracks are previously unreleased. 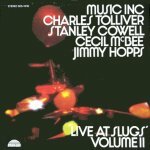 Charles Tolliver plays on tracks 1 to 7 on CD 1.